A who’s who of books worth reading. eidem accedit in fine appendix usque ad mensem Iunij 1704. 669G Index librorum prohibitorum Innoc. XI P.M. jussu editus usque ad annum 1681. Eidem accedit in fine appendix usque ad mensem junij 1704. Octavo 5 ¾ X 3 ¾ inches ≠3,≠≠8,A-Z8, Aa-Mm8,Nn4 This copy is bound in full modern calf. 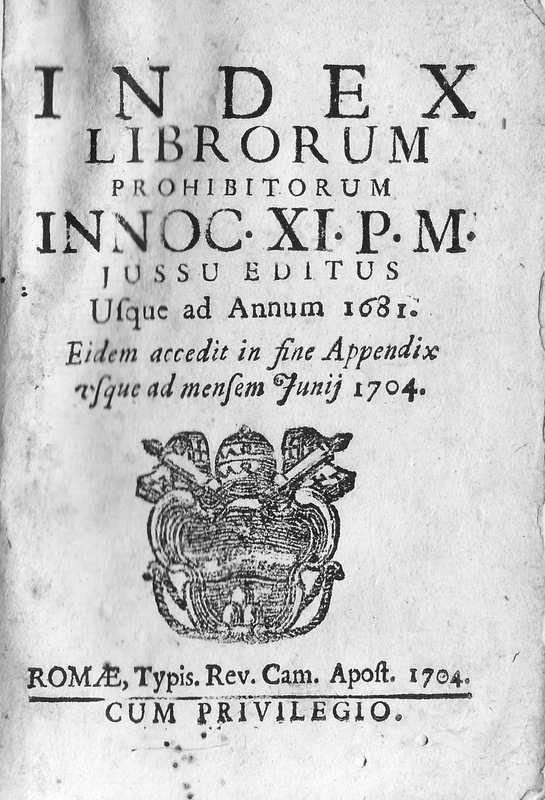 The Index Librorum Prohibitorum (English: List of Prohibited Books) was a list of publications deemed heretical, anti-clerical or lascivious, and therefore banned by the Catholic Church. In 1571, a special congregation was created, the Sacred Congregation of the Index, which had the specific task to investigate those writings that were denounced in Rome as being not exempt of errors, to update the list of Pope Pius IV regularly and also to make lists of corrections in case a writing was not in itself damnable but only in need of correction and put on the list with a mitigating clause (e.g., donec corrigatur (forbidden if not corrected) or donec expurgetur (forbidden if not purged)). This sometimes resulted in very long lists of corrections, published in the Index Expurgatorius. 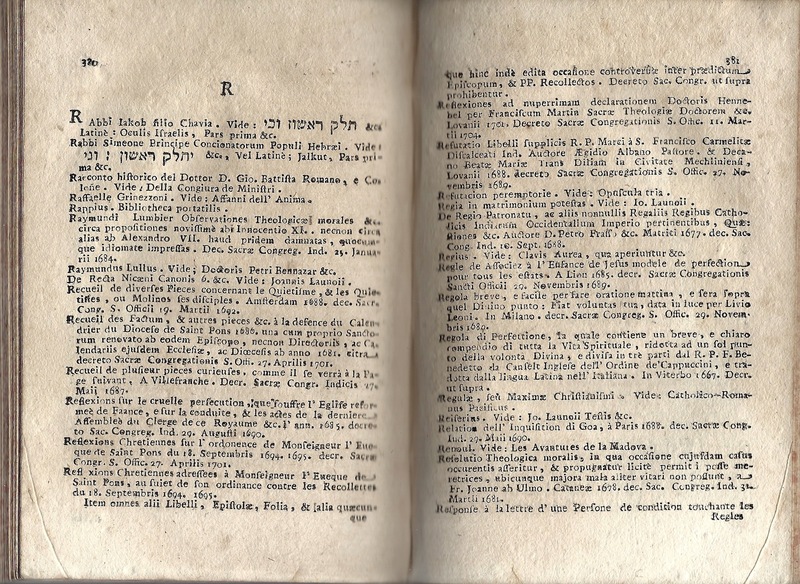 Prohibitions made by other congregations (mostly the Holy Office) were simply passed on to the Congregation of the Index, where the final decrees were drafted and made public, after approval of the Pope (who always had the possibility to condemn an author personally—only a few examples, such as Lamennai and George Hermes). The Congregation of the Index was abolished in 1917, when the rules on the reading of books were again elaborated in the new Codex Iuris Canonici. A first version (the Pauline Index) was promulgated by Pope Paul IV in 1559, which Paul F. Grendler believed marked “the turning-point for the freedom of enquiry in the Catholic world”, and which lasted less than a year, being then replaced by what was called the Tridentine Index (because it was authorized at the Council of Trent), which relaxed aspects of the Pauline Index that had been criticized and had prevented its acceptance. The aim of the list was to protect the faith and morals of the faithful by preventing the reading of heretical and immoral books. Books thought to contain such errors included works by astronomers such as Kepler’s Epitome astronomiae Copernicanae, which was on the Index from 1621 to 1835, and by philosophers, like Immanuel Kant’s Critique of Pure Reason. The various editions of the Index also contained the rules of the Church relating to the reading, selling and pre-emptive censorship of books editions and translations of the Bible that had not been approved by the Church could be banned. Catholic canon law still recommends that works concerning sacred Scripture, theology, canon law, church history, and any writings which specially concern religion or morals, be submitted to the judgment of the local ordinary. The local ordinary consults someone whom he considers competent to give a judgment and, if that person gives the nihil obstat (“nothing forbids”) the local ordinary grants the imprimatur (“let it be printed”). Members of religious institutes require the imprimi potest (it can be printed) of their major superior to publish books on matters of religion or morals.